If you’re psyched about the final season of Game of Thrones (and have a cool 25 grand or so laying around), you can keep your love of Westeros going with one of Fender’s new masterbuilt guitars from the company’s Game of Thrones Sigil collection. Produced in conjunction with HBO Licensing & Retail, the trio of deluxe, one-of-a-kind models represent three fan-favorite houses—the Game of Thrones House Stark Telecaster, the Games of Thrones House Lannister Jaguar and the Game of Thrones House Targaryen Stratocaster—and are built to order via the Fender Custom Shop. All three models were handcrafted by Principal Master Builder Ron Thorn, and according to Fender, each guitar’s design drew inspiration from the house’s family sigil, costume designs, armor and weaponry, as well as each of their locations in Westeros. For the House Targaryen Stratocaster guitar, Thorn drew significant inspiration from the family’s sigil, a three-headed dragon, as this Strat features carved dragon scales across the front and back of the guitar. The lightweight alder body is adorned with black hardware, a maple neck with ebony fretboard, a hand-cut and engraved sterling silver three-headed dragon sigil inlay on the first fret, as well as a hand-tooled and stained leather pickguard that also features the Targaryen sigil. The Strat also boasts an etched neck plate and is finished with thin lacquer over custom “Dragonglass Black” paint. - Game of Thrones House Stark Telecaster: guitar case features a faux wolf fur lining and a black suede exterior as an homage to the direwolf sigil of the Stark House. 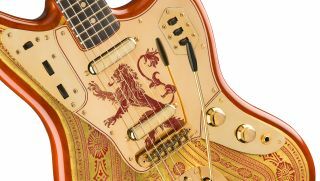 - Game of Thrones House Lannister Jaguar: guitar case features gold accents including a crushed gold velvet interior and all gold hardware. - Game of Thrones House Targaryen Stratocaster: guitar case boasts an all-black reptile design on its exterior with red stitching accents both inside and out.